It seems like a lifetime ago, but it was less than two years ago (December 18, 2015) that the lives of every Star Wars fan were changed forever when Star Wars: The Force Awakens was released. It was the end of a long road that started for many older fans who saw Return of the Jedi in 1983 and asked, "Will there be more? Is that the end of the series?" The prequels were nice, but we all wanted to know what happened next. With the release of the trailer, we finally saw glimpses of a new world and a new series of movies that has continued up to December 2017 when Star Wars: The Last Jedi will be hitting theaters. 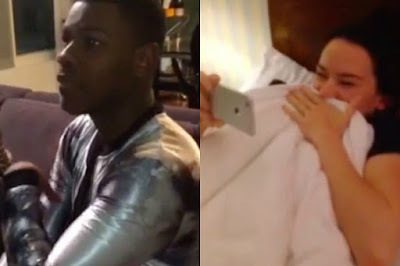 To bring back some of that thrill, we thought we'd go back to see this video of Force Awakens stars Daisy Ridley and John Boyega watching the official trailer for the first time. This was no moment of two seasoned actors watching the trailer in a comfortable theater, but two young actors at home watching with growing excitement just like all of us with the difference being that they saw themselves in that new world. Check out this tear-jerking side-by-side comparison reaction video. What did you think of the Star Wars: Force Awakens trailer? His reaction was priceless. Especially flipping over the couch.